This post has already been read 16377 times! That’s how Blake Bubak described his mindset Aug. 30 as the University of Nebraska at Kearney football team prepared to open its season against Missouri Southern State University. The 5-foot-9, 175-pound defensive back had been thinking about this moment for the past year. 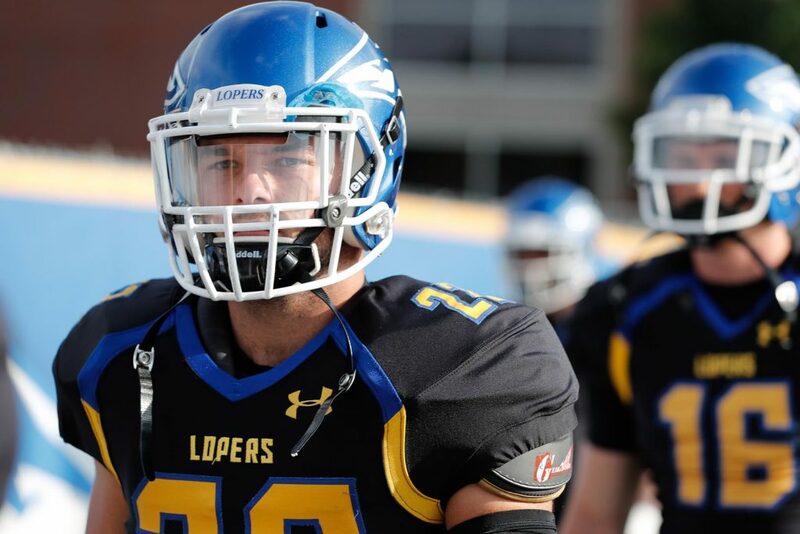 It was his first collegiate football game, a dominating 45-0 victory for the Lopers in which Bubak recorded five tackles and forced a fumble on a punt return, earning him special teams player of the game honors from the UNK coaching staff. The feeling from that night – playing in front of more than 6,000 fans and a “crazy” student section in the north end zone at Ron and Carol Cope Stadium – was “unmatched,” according to Bubak. The experience was well worth the wait. Defensive back Blake Bubak has nine tackles, including one for a loss, and a forced fumble through two games for the UNK football team. It had been nearly four years since Bubak appeared in a non-exhibition game, a 40-0 loss that ended his Columbus High School career. He still remembers all the details from that unseasonably cold Halloween night in 2014 when the Discoverers fell to Grand Island in the first round of the Class A state playoffs. Bubak finished the season with five interceptions, two fumble recoveries and a school-record 160 tackles while adding 34 receptions for 425 yards and three touchdowns on offense. Three months later, he committed to the South Dakota State University football team as a preferred walk-on, unknowingly starting a journey that would take him to three different schools over the next three years. Bubak, a two-sport standout at Columbus High who excelled in football and baseball, never made it to Brookings, South Dakota. “That’s a question I always struggled with,” Bubak said. After playing his senior season for the Columbus High baseball team then finishing his American Legion career with a trip to the Class A state tournament that summer, Bubak was having so much fun he decided to give college baseball a try. He contacted former UNK head coach Damon Day and headed to Kearney instead of SDSU. Bubak, a pitcher and outfielder for Columbus High who set the school records for triples in a season (7) and career (11) and shared the career mark for steals (15), didn’t find what he was looking for at UNK the first time around. 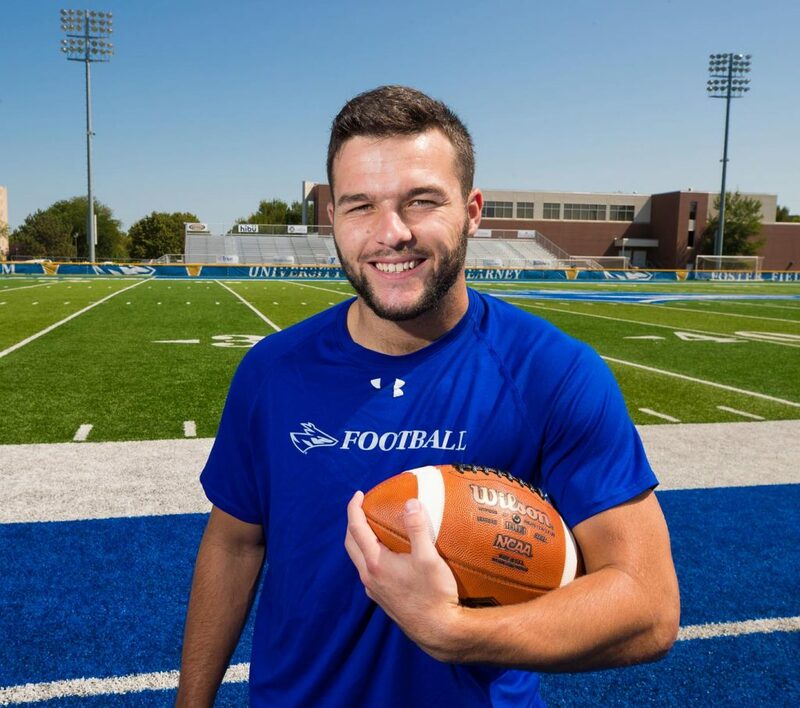 “The game just didn’t seem fun anymore,” said Bubak, who left UNK after one semester and joined the SDSU football team as a walk-on. That stint also lasted just one semester and Bubak was back in his hometown of Columbus by summer 2016. He took a break from sports to re-evaluate his future, enjoy college and spend some time “being a kid.” Bubak enrolled at the University of Nebraska-Lincoln and reconnected with some friends from Columbus, but he wasn’t getting the college experience he desired. He wanted to meet new people and get involved on campus, something that wasn’t happening in Lincoln. His final leap of faith came in January 2017, when Bubak returned to UNK and asked the coaches if he could join the Loper football team. “I just feel like I fit in,” he added. Bubak played in the 2017 spring game, recording five tackles, one sack and a pass breakup, then learned NCAA transfer rules would require him to sit out the regular season. As a member of the scout team, Bubak earned the defensive “iron man” award for his work ethic. Bubak tied for the team lead with eight tackles in the 2018 spring game, forced a fumble and recorded one pass breakup. He was more than ready for last month’s season opener. The starting defensive back followed that performance with four tackles, including one for a loss, in the Lopers’ 31-27 road victory Sept. 6 over the University of Central Oklahoma. That win gave UNK its first 2-0 start since 2011. Bubak, who was awarded a partial scholarship over the summer, finally feels comfortable about his future. He’s equally excited about UNK’s outlook moving forward. The 21-year-old recreation, park and tourism management major is a senior academically, but he’s eligible for two more seasons on the football field after 2018. He would need to add a minor or second degree to continue playing in 2020. “I definitely have options,” Bubak said. After a long journey to this point, Bubak knows he can trust his decision-making and instinct, both on and off the football field. “That gut feeling eventually led me back to where I am now,” he said. Blake Bubak played for the North team in the 2015 Nebraska Shrine Bowl at UNK’s Cope Stadium, recording five tackles and recovering a fumble. He also caught a pass for 23 yards and carried the ball once in the high school all-star showcase. UNK starting quarterback Alex McGinnis, a Crete High School graduate, went 4 of 4 passing for 79 yards and a touchdown while playing for the South team, which won the game 31-26. 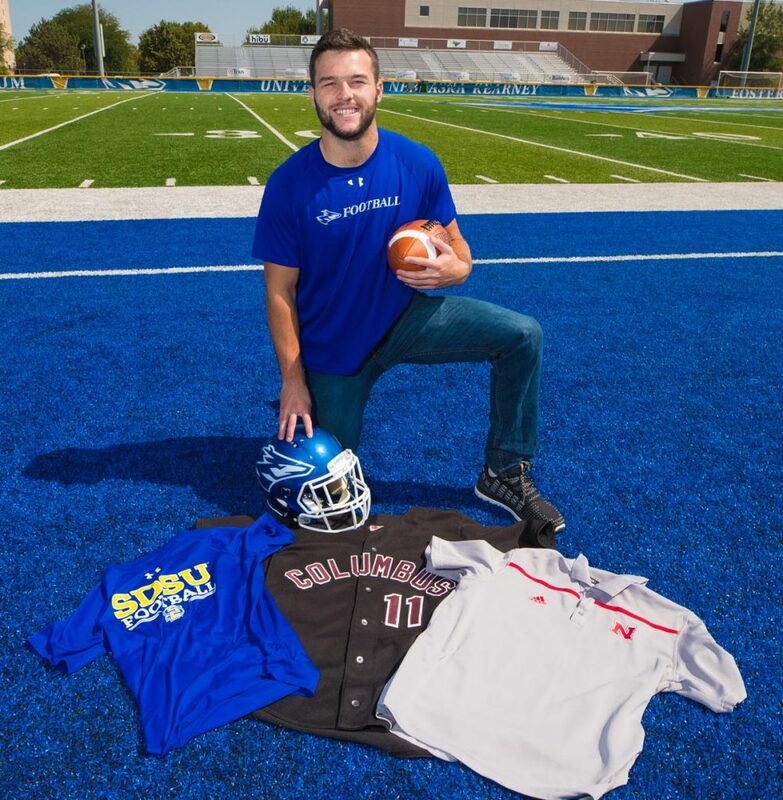 Bubak is one of three Columbus High School graduates on the UNK football team. Wide receiver Michael Koch and long snapper Nathan Slusarski are both freshmen. Bubak still gets his baseball fix each summer. He plays for the Leigh/Schuyler Crawdads of the Dodge County Baseball League.